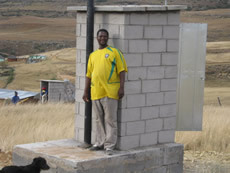 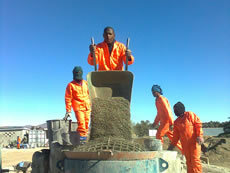 Amanz’ abantu Services was appointed through open public tender in October 2009 as the Professional Service Provider (PSP) to the Alfred Nzo District Municipality (ANDM) to undertake the eradication of the sanitation backlog programme within its municipal borders. 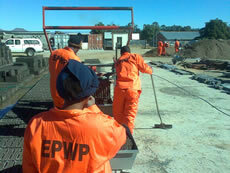 The estimated contract value for the period to June 2012 is R130 million. 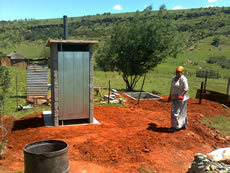 To date approximately 11000 toilets have been built under this contract within the Matatiele and Mzimvubu Local Municipality wards for the ANDM using labour intensive methods as proposed in the guidelines for Extended Public Works Programmes. 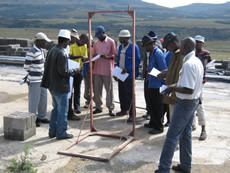 Amanz’ abantu’s role has been firstly to rejuvenate existing manufacturing infrastructure in five areas within the district. 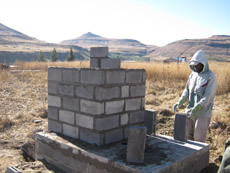 These facilities are commonly referred to as Zone centres at which cement blocks and pre cast components are manufactured according to the client’s specification. 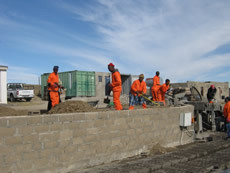 Secondly Amanz’ abantu is also responsible for the building programme in priority villages as determined by elected Ward Councillors in conjunction with the community based project steering committee. 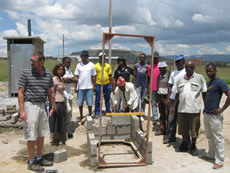 Local community members are trained as builders who construct VIPs under supervision by Amanz’ abantu according to predetermined quality standards. 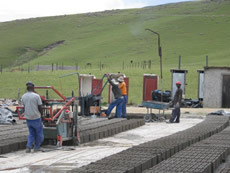 Most transport for material deliveries to households is provided by local SMMEs, further stimulating local economic development.